A page devoted to watering your roses seems a little silly, right? After all roses need water like any other plant so just give them water. Of course roses need water, but how you water them can make quite a difference in their growth, hardiness and health. 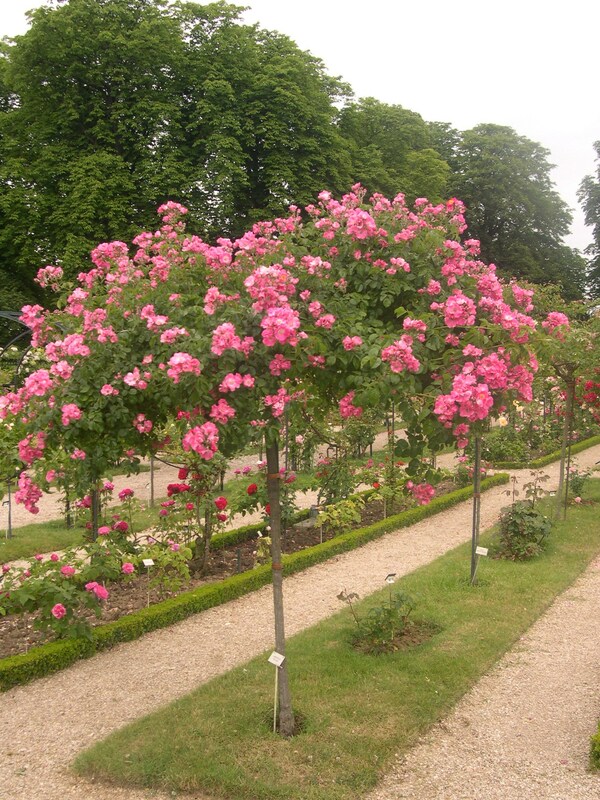 Ideally we want to encourage our rose’s roots to grow as deep into the soil as possible. The deeper they go the better they can find nutrients, withstand drought and become naturally healthy plants. While the top soil may be dry but the soil down below is still moist. If you live in an area with clay soil you’ll know what I’m talking about! For this reason we advise you do infrequent deep watering. If you water a little everyday your roots aren’t going to bother to dig down into the ground to look for water. Why should they when everything they have is right at the surface? If your refrigerator was always full would you bother going to the grocery store!? By watering infrequently and soaking when you do, you’ll force the roots to dig down to look for water. Once your roses are established here is a little test to see how often they’ll need to be watered. Soak your roses and mark the date on your calendar. Watch the roses and when they begin to wilt you’ve gone one day too long between watering. Count the number of days from the time you soaked them and now you know how often to water. Repeat the test occasionally and you’ll find over time you have to water less and less. If you live in an area with normal rainfall, have a living soil environment with mycorrhizae and apply a good layer of mulch you’ll find overtime you won’t have to artificially water your roses. I realize this runs contrary to what you’ve likely read about roses being water hogs. I used to think so too, but I haven’t irrigated the established roses I have in over five years. Even during drought! Water as needed to get new roses established. Soak them well with 3-5 gallons when you do water. Gradually increase the time between watering to encourage the roots to go deep. Keep your roses well mulched. Please read our “Novice Corner” article “Deeper, Deeper“. I am involved in a few projects involving a rose garden here on the east coast. One of which is an International Rose Trials which means we will be replanting rose beds every two years. As I’m sure you are aware there is increasing evidence that mycorrhizae can combat what is known as “rose replant disease”. To this end I’d like to talk with someone at your company about setting up a protocol. And are your products available on the east coast?